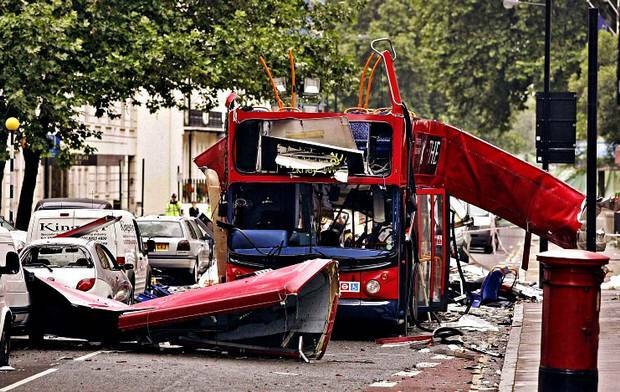 Life changed for many after 7/7. For the families of the victims and the injured of Britain’s worst mainland terrorist atrocity, today’s 10th anniversary is a time to reflect and remember. But for the seven million other Londoners, it’s also a day that changed our lives forever. It was the impetus for thousands, myself included, to start biking to work. This morning as I cycled from King’s Cross past the camera crews from around the world assembled to cover the anniversary, I was involved in a cycle pile up. I managed to swerve it, but one man lay injured and shocked on the main road. It was just near Upper Woburn Place, where the Number 30 bus exploded. The urban peloton came to his aid and I helped him to safety. He was bruised and shocked but was fine. I told him to get an antiseptic wipe, gave him a manly pat on the shoulder and went on my way. I’ll always remember July 7 2005. 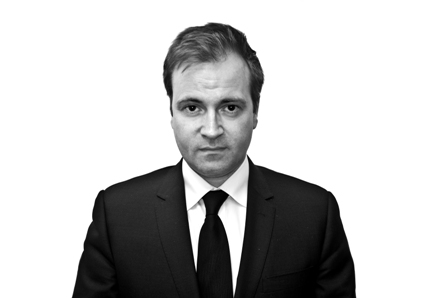 I was working at a PR consultancy in Clerkenwell. The agency was on a high. We’d just landed a contract with the ECB to promote the Ashes against the Aussies. The ECB had decided to do a roadshow around the test match cities to show the matches in nearby parks. They called it Cricket in the Park and we were charged with raising publicity for it. It was the time of awareness raising wristbands and Live 8. 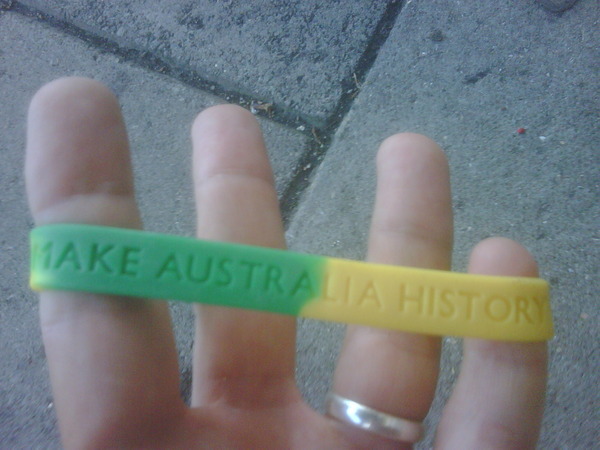 So I came up with the idea for a yellow and green band that read Make Australia History. I ordered 10,000 from China to distribute at the events and we had plans to get celebrities to wear them. We also had an eight foot cricket bat that we were taking around the country for people to sign, including Prime Minister Tony Blair. We’d even arranged for Tony to play cricket in Downing Street with a couple of England players. He probably would have worn my wristband too. Weeks later, the players were relieving themselves in his garden! But everything changed on July 7. The management had gone for an away day and I and a couple of others were left in charge of the office. It’s then we heard on rolling news that there’d been a power surge on the London Underground. No-one was unduly concerned, other than to think if friends might have been caught in delayed tubes. Then a bus exploded and panic set in. It was a young office and the dawning realization we were in the middle of terrorist incident that locked down a city, was too much for some. Many girls were in tears as they tried and failed to get in touch with friends and loved ones. The mobile phone networks were constantly crashing with the overload of calls. It was like New Years Eve x 10! So we called the staff together. I can’t remember my exact words other than to say we were safe here and that I promised we’d get through it. The advice from the police was not to leave the office unless it was an emergency. That meant no-one could get out to lunch. So I eventually managed to ring the nearest pizza take away. I reckoned that if they were nearby, they’d be more receptive to deliver. They were in the same position as us and they’d appreciate the business. Thankfully my hunch was right. So I ordered 20 pizzas and 20 bottles of soft drink. It took a couple of trips, but we all ate and nerves were settled. We even turned it into party and cranked the music up too! As home time approached, we had to make a decision on whether to let the staff go home. The guidance was that it was safe but the buses and London Underground ground to a halt. And so we all walked home together. I remember it so vividly. The streets were so still as people flocked out of offices and shops and made their way home. There was no panic, no annoyance. Just tens of thousands of people showing their defiance to the world by heading home with a quiet dignity. This was a time before social networks so I arranged to meet friends at a pub in central London via email. After the half-hour walk, I met my friend Tony Hannon and other pals for pint. Everyone else had their story to tell. But I’ll always remember that everyone was so calm, so stoic. A Canadian film crew collared us and spoke to Tony. Hours later he got a call from a relative in North America to say she’d just seen him on the network bulletin! Following 7/7, Downing St rightly felt it would be inappropriate to play cricket in Downing Street, especially when they’d arranged a meeting with Muslim community representatives for our time slot. We ended up sneaking the eight foot cricket bat into Downing Street in a black bag and TB signed it. It looked like we were carrying a weapon of mass destruction! The wristband may not have gone viral – it was quietly dropped after 7/7 – but England still Made Australia History and the Cricket in the Park events were a great success. But I’ll always remember July 7th. A day when people coped with an extraordinary event by being ordinary. Today I’ll eat pizza at my desk and raise a pint in the same pub to remember those who died. And mark a time when all stood and walked home together. On 7/7 we didn’t make terrorism history. But we showed why it will never defeat us.